Leading brand of camping and survival gear receives 5-stars for its 1100th review on Amazon. Woodbridge, United States - August 15, 2018 /MarketersMedia/ — Surviveware, a popular brand name among campers, hikers, EMTs, and survival enthusiasts is pleased to announce that its Compact First Aid Kit has received its 1100th customer review on Amazon, with an overall average rating of 4.9 out of 5 stars. Surviveware has continuously strived to meet the growing needs and demands of travel aficionados and emergency responders for adventure and disaster preparedness. Their long-trusted Emergency Compact First Aid Kit is now becoming a household name for portable medical kits. This handy and light-weight kit combines functionality and comfort into one preparedness pack. Each kit contains 100 pieces of medical supplies that one might need in an emergency situation. The items are organized and labeled to ensure that everything is “in place” and easy to locate This strategy allows users to minimize the time needed to retrieve the necessary supplies in any instance. Despite its completeness, the company has allotted ample space for customization and inclusion of personal items such as medicines and ointments. It cannot be stressed enough how important it is to carry a first aid kit during travels and adventure trips. 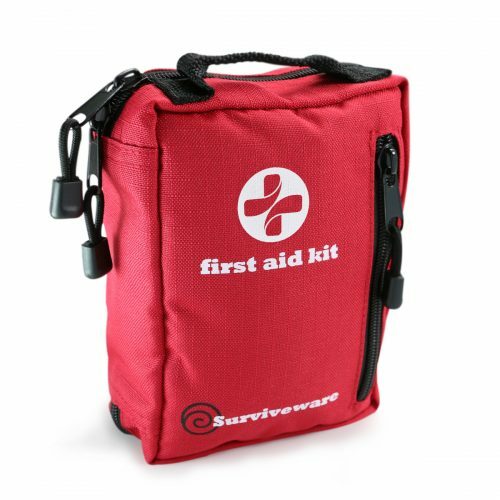 A Surviveware’ customer experienced the need for a first aid kit during a day hike, as related in his review, “I have purchased this product before from your company. I love how compact and lightweight it is. And I like how all the medical supplies are in their own plastic bags and places in labeled pockets of what they are. I will tell you a story that happened to me about two months ago while hiking. I thought to myself before I went should I take my medical kit, so I brought it along. Good thing I did. I put it in my backpack. Me and my cousin were hiking some trails looking for a waterfall that we heard about. We found the waterfall, and she stayed up top, and I climb down to take some pictures of her on the top of the waterfall. After I took the pictures, I was running up the Side of the waterfall which I should not have done I should’ve taken my time. But I slipped and bashed my knee open on a sharp rock. At first, I thought to myself what do I do? I am out here with no medical supplies, and I’m bleeding really bad. But then I remembered I had your medical kit in my bag it’s so lightweight that I forgot it was back there. Surviveware's kit is small and only weighs 1 pound. It allows hikers and backpackers to travel light. its dimensions (5.5 x 7.5x 3.5 inches) make it possible to fit into any traveling bag, glove compartment, or daypack. In celebration of the product’s milestone, Surviveware is giving away 20% discount coupons to its valued customers. It is the company’s way of showing their appreciation for the unparalleled loyalty of their customers. Click here to get your promo code.